Step 1: Open your mobile browser. Step 3: Log in with the LSUHSC specific info. To obtain the LSUSHC login, contact mknapp@lsuhsc.edu, or view the ‘Mobile’ page on the Micromedex site. (Note: The login should last for the current quarter on your device. At the end of the quarter you will need to return to the MobileMicromedex site to obtain a new username and password. Early reports from some of our users note that mobileMicromedex might be a little slow and the interface could be improved. Let us know your thoughts on this new product! 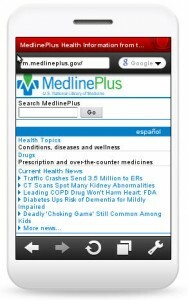 You can now access FREE patient health information in both English and Spanish on your mobile phone. Go ahead! After all, your US tax dollars pay for it. You can now access basic library information and databases on a web page formatted for smaller screens like your iPhone or PDA. http://www.lsuhsc.edu/no/library/mobile/mobile.html to access directions, hours, databases and more! RefWorks, the popular web-based bibliographic management system, is now available via web-enabled mobile phones, smart phones, and personal data assistants (PDAs). Your Group code is required. For more information on group codes, see our RefWorks info page. STAT!Ref, an online book provider of over 80 medical, dental and nursing textbooks, is now optimized for mobile devices. Simply access the link from your phone or PDA’s browser and you will be automatically redirected to the mobile site. You must be able to access to the internet on your mobile device to use STAT!Ref mobile. PsychiatryOnline (off campus link), an ebook provider of psychiatry textbooks, is now available for Mobile browsers. Access to the mobile site is included as an added benefit of current subscriptions. You will be automatically redirected to m.psychiatryonline.com when visiting the main PsychiatryOnline.com site from a wireless-enabled mobile device (such as a smartphone or PDA). Before your first mobile visit, be sure to create a free personal ?óÔé¼?ôMy PsychiatryOnline?óÔé¼?Ø account. To create an account, go to www.psychiatryonline.com from a desktop or laptop computer while authenticated by your institutional subscription, click the ?óÔé¼?ôMy PsychiatryOnline?óÔé¼?Ø link from the homepage, and follow the instructions for creating an account. Your ?óÔé¼?ôMy PsychiatryOnline?óÔé¼?Ø username and password will then give you access to the mobile site. (IP-based recognition is not possible from mobile devices, and accounts cannot be created from the mobile site.) The mobile site will prompt users who haven?óÔé¼Ôäót yet created My PsychiatryOnline accounts with these instructions. Most mobile browsers are limited in their ability to transmit large files quickly, so only the most essential information is included in the mobile version of PsychiatryOnline. Search and navigation are simplified as well, to better suit the small mobile screen (e.g., the ?óÔé¼?ôrelated content?óÔé¼?Ø links usually seen at the left of content have been removed to unclutter the screen). Mobile site users do, however, get full advantage of PsychiatryOnline’s powerful semantic indexed search. Diagnosaurus, a free differential diagnosis tool featuring content from Current Consult Medicine 2007 is now available for iPhone. PDA medical software provider Epocrates has produced a healthcare professional’s guide to choosing and using a mobile device. Although this guide is produced by a company that is trying to sell you something, it is still a decent introduction to mobile devices and the various jargon associated with them. Planet DDS, a provider of web-based dental software, has recently created an interface with the iPhone, Medical iPhone blog reports. Denticon Web-Based Practice Management on iPhone has capabilities for scheduling, records management, insurance billing, digital radiography, and more. Dynamed, the point-of-care reference designed to provide the best available evidence to support clinical decision-making, is now available for iPhone and BlackBerry. Interested LSUHSC users with these mobile devices should contact MKNAPP@LSUHSC.EDU for a Dynamed serial number & detailed directions. Natural Standard provides evidence-based information on herbs & supplements, health & wellness, allergies & immunology, interactions, and conditions. Now LSUHSC members can access this database on their mobile device! To get your free download & serial number, send an email Maureen “Molly” Knapp at the LSUHSC Library. Please use your LSUHSC account if you can, so we can verify your eligibility. If you want more information on Natural Standard read this review from the Journal of the Medical Library Association. Recycle your old cellphone or PDA for free! Are you the new owner of a shiny new iPhone or other handheld device? Before you chuck your old phone or PDA in the garbage consider Palm’s Take Back and Recycling Program. The Palm Take Back and Recycling Program strives to keep Palm Handhelds and Treo smartphones out of landfills- and they gladly take other companies’ devices and all related accessories. Just place your handhelds, mobile phones and related accessories (chargers, headsets, memory cards) into a box large enough for you to safely send in all your retired mobile devices, apply the postage-paid mailing label, and put it in a mailbox or bring it to the post office. It’s free and a great way to reduce your carbon footprint.